Zarf Updates: Meanwhile is now available on Steam! Plus extra DLC comic! Meanwhile is now available on Steam! Plus extra DLC comic! Jason Shiga's Meanwhile is now available on Steam, and also on Itch.IO. 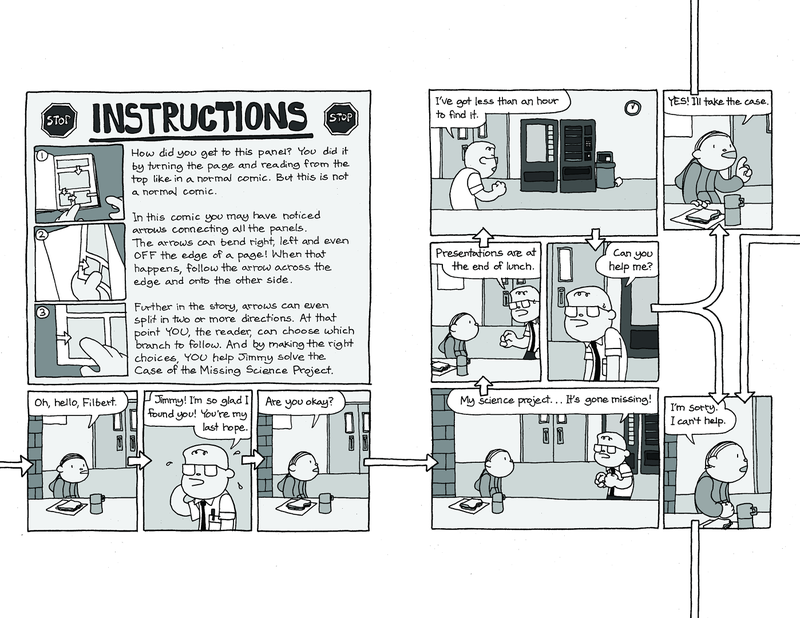 iPhone owners (and people who frequent indie comic shops) are familiar with this groundbreaking interactive comic. Now we are excited to release a version for home computers: Mac, Windows, and Linux. Special thanks to Doug Orleans, Bob Igo, Cheeseness, Uxilo, and Oreolek for very last-minute Linux testing. I threw the Linux build together over New Year's and I never did figure out a way to test it. (Mac Parallels can't cope with Unity builds -- not enough OpenGL squirrels in the VM.) So the fact that it works is entirely down to the test volunteers. But wait, there is more news! That's pretty cool, but the second DLC item is even cooler: The Case of the Missing Science Project! 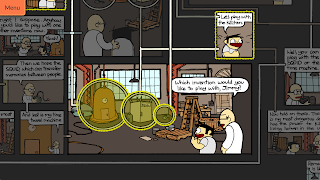 The Case of the Missing Science Project is a new Shiga choose-your-path comic. 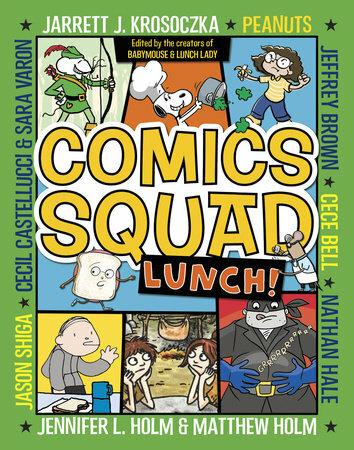 Well, it's nearly new -- it was originally published in a 2016 comics anthology called Comics Squad: Lunch. Follow Little Jimmy, Kid Detective as he attempts to unravel the case! There may be dinosaurs! Now, let's be clear: The Case of the Missing Science Project is shorter than Meanwhile, and it's not a computer-playable app. When you purchase the DLC package, you will receive a PDF file which you can print out, fold, and staple. 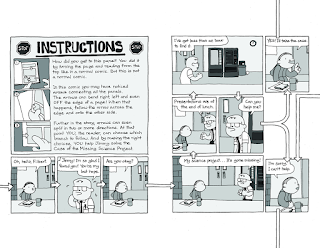 Thus you will wind up with a physical mini-comic of some twenty pages. Why are we distributing it this way? Well, one answer is that Missing Science Project was a last-minute addition and I didn't have time to build a Unity version. This is accurate, but boring. A more interesting (but still accurate!) answer is that Missing Science Project has its own unique path-following mechanic. To say more would be a spoiler, but it's a unique idea which only makes sense with pages. 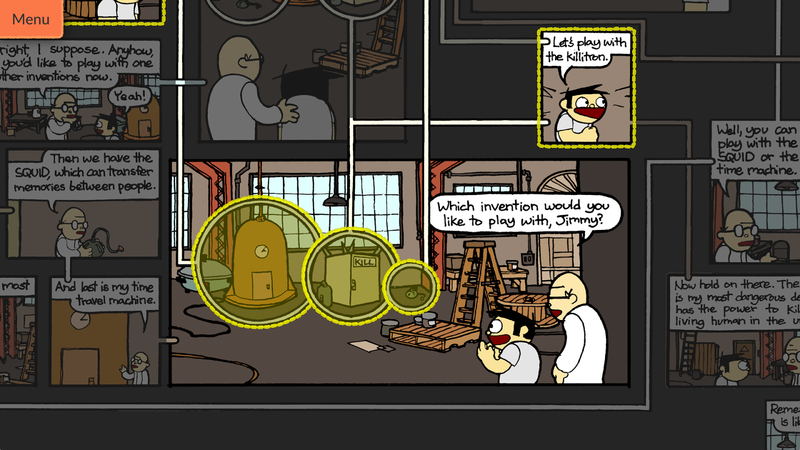 It doesn't make sense to reformat the comic into a single large map, like Jason did for Meanwhile. Creating a digital version of Missing Science Project is an interesting problem, and I might try it someday. But for now, this print-and-staple version is what you get. There's nothing wrong with paper. Or, of course, you could buy Comics Squad: Lunch, a fine book which includes several other short comics for kids. Edited by Jennifer L. Holm, Matthew Holm, and Jarrett J. Krosoczka; published by Random House, 2016. Michael Gentry has posted a coming-soon page for a Steam release of Anchorhead. Anchorhead is one of the classics of the modern IF era -- it was originally released in 1998. 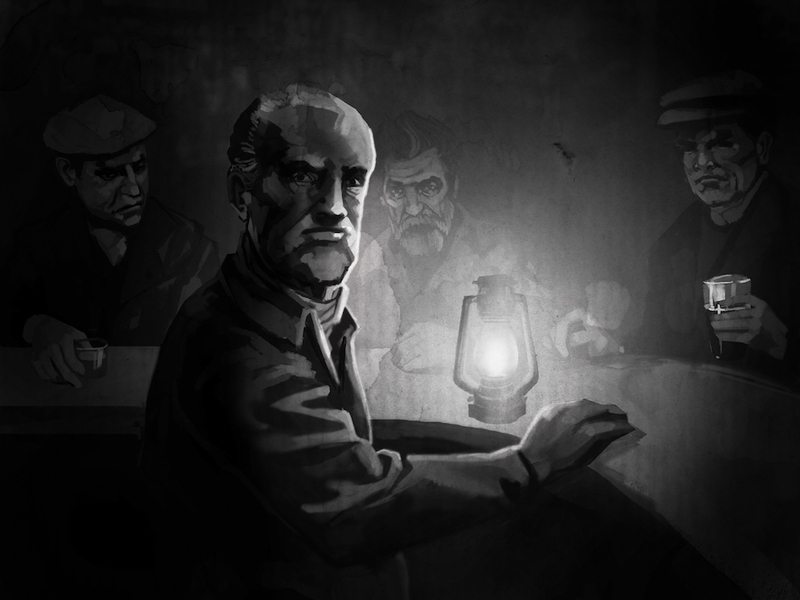 It's a weird-horror puzzle game in the best Lovecraftian tradition. Michael has now completely reimplemented it in Inform 7 and added atmospheric hand-drawn illustrations. Anchorhead appears on Steam courtesy of my Lectrote interpreter, the same one I used for Hadean Lands. It launches on January 31; keep an eye out! 1. There's not a single button I can click to advance the story between choices. It's infuriating that I have to alternate between hitting a directional key and space or enter; I should just be able to hit space or enter to advance panels. 2. There should be a hotkey for Go Back (if there is, I haven't found it and it's not in the "about the game" text). Instead I have to hit Esc and then click Go Back. 3. Similarly there should be a hotkey for Go Back. Or, better, I should just be able to double-click on a panel to jump to it; right now I need to hit Escape, hit Browse, then click on the panel. 4. Story So Far is useless if I've selected a panel from browse mode. Ideally it should list all the decision panels starting from the start of the book, as if I'd played up to that point (or at least one possible history taking me to that point, even an incorrect history is better than none at all). I've been looking forward to Meanwhile for months, and it's really disappointing that it's in such bad shape. 3) Should read "Similarly there should be a hotkey for 'Browse the Map'...", sorry. However, I fear you have misapprehended the situation. I have spent a *lot* of time thinking about the UI of the Meanwhile app (in its various incarnations), and the best behavior for it on touchscreen, controller, keyboard, mouse, etc. I've tried a lot of variations and the result has gotten plenty of playtesting. The behaviors you see are the behaviors that I decided were most appropriate to the purpose of the thing. Alternatives worked less well. Thanks for your response. I guess we just have incompatible aesthetic preferences in this case, or something like that... For me the lack of hotkeys, difficulty in entering/exiting browse mode, etc, are making the process of backing up and making a different choice feel like a pain instead of something fun. So I'm really discouraged from exploring the space of possible choices, which doesn't feel like the intended outcome in a CYOA game. I think I will probably be asking for a refund, unfortunately. Looking forward to your future projects!